This plugin is inspired by this NYT-article. It offers a new command on XMPP via the ad-hoc server built into Adium since SoC 2007. When you log in to the same account from another computer (with a different resource), it allows you to tell the other Adium instance to capture a photo using the iSight camera built into all of the recent MacBooks and MacBook Pros (or any other webcam connected to the machine in case it doesn't have one built-in) and send it to you via the XMPP server (in-band to avoid firewall issues), and additionally respond with a list of the public IP addresses of the other Mac. To activate it, log in on both Macs using Adium with this plugin installed, and then navigate to the account's submenu in the File menu, and select "Capture Thief (X)" where X is the resource of the machine with the camera. 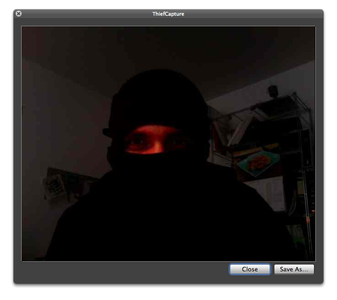 The victim can only see a short flash of the webcam activity LED, but then it's already too late. Of course, there are other applications for this, too. It requires at least Mac OS X 10.5, two Macs (one with a webcam obviously), Adium 1.2.5 and an XMPP account. Note: This plugin is released under the GPLv2. You can find its source at /plugins/trunk/ThiefCapture in the adium svn tree. It demonstrates how to capture a frame from the built-in iSight using QTKit, how to add new ad-hoc commands and how to send and receive custom XMPP messages. This also means that this plugin no longer works with any earlier version of Adium! Sorry! IT would be really cool to tie this in with the skyhook (http://www.skyhookwireless.com/developers/) database too, so you know where to find the thief! Unfortunately, you won't be able to pinpoint the exact flat the device is in. It'd work fine for free-standing houses, though. has it to be updated?